Stamping In Living Color: Luv for SnowBunny Bella! Happy New Year, fellow stampaholics! I've been having a ball creating cards with the SnowBunny Bella stamp. Although she's not new, she's still a diva. 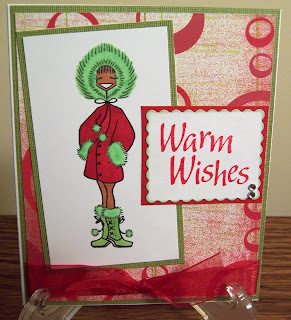 This Bella image has a lot of style and adds pizazz to any card creation. I especially had fun using fun flock to emphasize the fur on the coat's hood/cuffs as well as the cuffs on the boots. I can't believe I don't own this stamp! I will definitely add Ms. SnowBunny Bella to my collection the next time I place an order with Em'. If you're interested in any of the Bellas, you will find them at StampingBella. To view more cards using Bella images, check out the popular stamper's community: Splitcoaststampers. I must warn you...these cute stamps are highly addictive. You can't own just one.